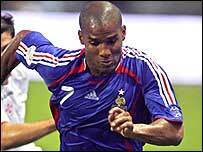 France midfielder Florent Malouda insists he is determined to move to Chelsea, despite Lyon rejecting a £12m bid for him this week. Malouda, 27, told French newspaper Le Progres: "It would be better for everyone if my transfer to Chelsea is finalised because I want to leave. "I have made my choice. I have talked with the coach Jose Mourinho. "The directors know I want to leave and in these conditions I can't see me playing for Lyon anymore." Lyon president Jean-Michel Aulas says Malouda can leave the French champions - but only for the right price. Aulas told his club's website: "We will help him to leave if we get offers to the level we are expecting but if there are not any such offers he will stay." Lyon have put a £17m price tag on the player and have already lost another French international, Eric Abidal, to Barcelona this week. Malouda, who has also been linked to Liverpool, added: "Even if another club is ready to offer more money, I am determined (to go to Chelsea) and have been for a while." If he does move to Chelsea, Malouda will link up again with Didier Drogba, with whom he enjoyed success at Guingamp in 2002-03.